In order to find source of unaccounted money entering in to real estate, government has proposed one percent TDS (tax deduction at source) on transfer of immovable property. 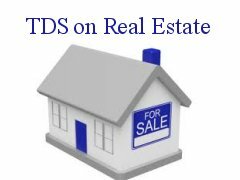 1 % TDS to be deducted if sale value of property exceeds Rs. 50 Lakh in urban area (City) and Rs.20 Lakh in Rural area. All immovable properties, other than agriculture land would be covered under this provision. This rule shall be applicable from October 1st, 2012. So in urban area on property transfer of Rs. 50 Lakh Tax deduction at source will be 50,000 Rs/- and in rural area on property transfer of Rs. 20 Lakh Tax deduction at source will be 20,000 Rs/-. Rule clearly says that transfer of property would not be registered unless the buyer furnishes proof of deduction and payment of TDS. As per current provision tax is required to be deducted at source by the transferee on transfer of immovable property by only non- resident. This is newly introduced requirement on transfer of such property by a resident. You might be thinking that government only increase tax burden but reality is different. Let’s look at reason why this rule is introduced. (1) To reduce black money in real estate market. (2) To find out source of black money generation. (3) To create transparency in reality market. (4) To make reporting mechanism of transactions happening in the realty sector. (5) To find out / generate new Tax payer. (6) To generate more tax collection. To make this rule successful good amount of understanding and positive approach is required by buyer, seller and income tax department. In India real estate has become synonyms of black money. Not only real estate but gold & silver is adopted way to park unaccountable (black) money. As per latest trend many people give property and jewelry as gift in India. Although gift tax type of rule is incorporated by government but unfortunately this rule fails to catch this type of transactions. People may be dealing in black money due to high tax rate or other catch enforced by government. You may not know massive flow of black money in real estate market this answer can be given by person who is actually associated with real estate market. Let’s hope that this effort of finance minister will be successful to prevent black money or to create transparency in real estate market. Some steps taken by government such as registration and payment of stamp duty as per market value has given mix result towards reducing flow of black money but black money is not fully removed from reality market yet. or may cause more cash transaction in real estate market. (1) In today’s situation city like Mumbai, Bangalore, Delhi 500 Sq. foot place will cost more than 50 lakh. 1 % TDS of 50 lakh will be 50,000 Rs/- usually this cost is borne by buyer but tussle may happen between buyer and seller on this point. As on today stamp duty and all registration cost is bear by buyer. (2) Not only that to get this TDS money back you can file return but refund will be time consuming and tedious process. Once this amount given as tax to get this money back from government is not that easy task every tax payer knows this. That’s why people use various sections such as 80 C to save tax & to avoid TDS refund process. Not only real estate finance minister has made proposal to cut TDS on purchase of gold bullions or gold jewelry. This rule is applicable on cash transaction of 2 lakh or above. Over here person who is selling gold is responsible for collection of TDS. It may be noted that in order to circumvent TDS people may approach to purchase gold jewelry below 2 Lakh and property below 50 Lakh. Thanks for contribution such helpful information. The information provided is very nice and this information is not available so easily. Therefore I thank the writer for the useful input. Thanks for appreciation; I think it is very nice that you have got refund in 6 months from date of filing returns. I have yet not got refund for FY 2010-11. Bro, the IT Refund process has really gone way better than last year. The are settling the refunds for individuals in less than 6 months now. Though its a good informative post for most of the Indians!